Bell Canada president George Cope knows how crucial a support structure can be for those suffering from the debilitating effects of mental illness: It was only with additional help that his own mother was able to grapple successfully with depression. With that deeply personal understanding of the issue, Mr. Cope has launched an unprecedented, $50-million initiative spread over four years and various national projects. It aims to help spark a debate about how Canada can better deal with mental illness, from the impact the issue has on ordinary Canadians and the national economy to how politicians and corporate leaders can use their money more wisely. Bell Canada’s four-year project, which one mental-health advocate called a “seismic breakthrough,” launched in the nation’s capital on Tuesday with an initial $1-million investment for tele-psychiatry at the Royal Ottawa Hospital. But mental illness is a matter of concern for more than just those directly affected. It is a critical task looming ahead of employers and the stewards of the country’s economy, for whom mental health is a multibillion-dollar issue. It is estimated that a single employee on short-term disability due to a mental illness can cost a company upward of $18,000. That immense economic toll, magnified through Canada’s work force, amounts to roughly $51-billion a year in costs and productivity loss, with roughly $34-billion erased in Ontario alone. Mr. Cope, head of the country’s largest communications company, is a literal titan of industry at 6 foot 7. And mental-health advocates hope the willingness of such a high-profile CEO and company to be open about – and fund – the sensitive issue may help spur a frank dialogue about mental health and its impact on society. In addition to the big investment, Mr. Cope is calling on the nation’s politicians and business leaders to begin funding research and support mechanisms for mental health in a way that matches the issue’s staggering impact – affecting roughly one in five Canadians. “The area has clearly been underfunded, from a government perspective, from a charitable donation perspective and also, I think, from the corporate sector,” Mr. Cope said. Mary Deacon, who will help lead Bell’s new mental-health initiative, lost one brother to suicide only two weeks after she gave birth to her daughter in 1991. She lost a second brother, who also suffered from depression, in the same manner shortly after the first tragic experience drove her into the CEO seat at Centre for Addiction and Mental Health (CAMH) in Toronto. Over the decade she headed the organization, she said, she saw a growing willingness in corporate leaders to fund mental-health initiatives. It may also be a strong statement to businesses sitting on the sidelines. Bill Wilkerson, founder of the Global Business and Economic Roundtable on Addiction and Mental Health, said it is encouraging to see a large company make such a commitment. He said Bell is following in the footsteps of Great-West Life (the large insurance company funds the Centre for Mental Health in the Workplace) and Canada Post Corp. (which created the Canada Post Foundation for Mental Health). “We now have the post office, the phone company and the insurance company at the table,” he said. In a separate announcement on Tuesday, the Canada Post Foundation for Mental Health announced more than $1.5-million in grants for 32 non-profit organizations that provide support and treatment programs for those with mental health issues. But Mr. Wilkerson said there is still one really important player missing – Canada’s largest employer, the federal government. He said the time has come for the public sector to follow the private sector’s lead and start investing in a healthier workplace. 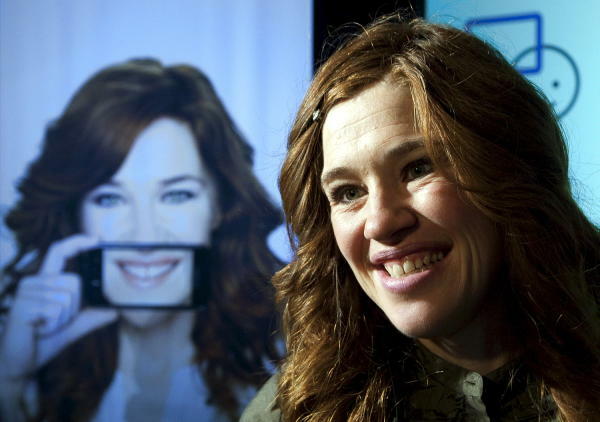 Bell’s effort to encourage dialogue and donations has found an iconic spokesperson in speed skater and cyclist Clara Hughes (pictured), a six-time Olympic medalist. Mr. Cope told Ms. Hughes, whom Bell sponsors, about the company’s plan last spring. She immediately decided to jump aboard, partly because of her earlier battles with depression in 1997, after her first Olympics. Certainly Ms. Hughes knows the effects of stress, and how to combat them. Shortly after a hectic news conference announcing the initiative in Ottawa on Tuesday, she fled the city for a three-hour bicycle ride deep into the Gatineau hills.